It was tough just picking five, of course. These episodes made the cut because I particularly liked the lessons. They take you through the process of creating great photos, building an audience and making an impact. 1 — Which of these three photography stages are you in right now? This episode is a great diagnostic tool. After years of hearing people talk about wanting to get to the "next level," I decided that phrase was a little too vague. If I was going to help you get to the next level, we needed to define the stages. Use this episode to identify where you are on your learning path and how to get to your next steps. 2— These eight questions will help you create great photos walks you through my core philosophy of photography — the answers are in the questions. Take these eight prompts with you whenever you shoot, and you always should be able to capture something interesting. 3 — How photographers use social media for results. These days, it's next to impossible to build an audience without using social media. 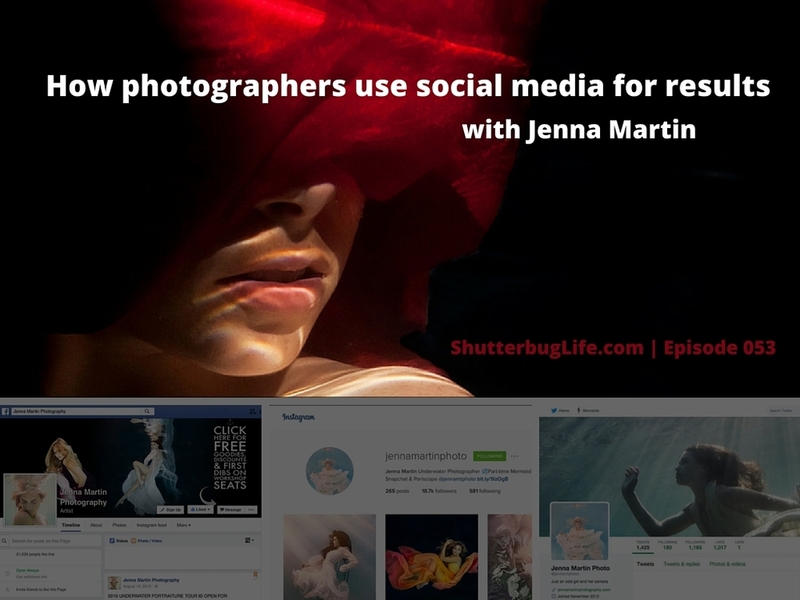 I brought back Jenna Martin to talk about her social media best practices. This episode is like a virtual workshop. 4 — Why you need a photo blog. I started 2016 with a challenge. I tried to convince you of a simple premise - to really make an impact, you need a platform. You need somewhere, not just for your images to reside, but for you to tell your story. You, my dear photographer, need a blog. 5 — The value of your image has nothing to do with these three things. Everyone from your shrink to your mother preaches that you have to love yourself. That means your photos, too. You have to love your images too much to give them away cheaply. You have to know the true value of your image. If you enjoyed these five episodes, I promise many more like these going forward. You don't want to miss any, so subscribe now. Join our Shutterbug Life.